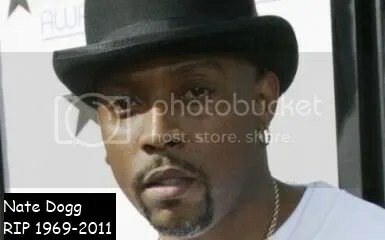 Anyone who is a fan of hip-hop will know who Nate Dogg is. He’s most famous for singing hypnotic inimitable hooks on hit records with the likes of Warren G, Dr Dre and Snoop Dogg. He was also a hit record producer in his own right and sadly he died yesterday on March 15th 2011 at the age of 41. Causes are currently unknown but he had suffered two strokes previously. I grew up listening to a lot of records that he was on so I felt it fitting to do a tribute to him. Below are a few videos of records that he was on so you can enjoy the music he made which will sadly outlive him. This entry was posted in Hip-Hop and tagged Dr dre, hiphop, Nate Dogg, Snoop Dogg, Warren G by krazyangelkat81. Bookmark the permalink.